Released in association with Pflichtkauf. Everything breaks down, ultimately ending. People come and they go and all we're left with are the memories of what was. 'Home' is a chronicle of all the meanings this word can have, peppered throughout it's run you'll find your mind wandering along deserted highways early in the morning with the lights overhead reducing you to just a microbe on some grander glass slide. Heavy usage of reverb is the order of the day with Ahnst's latest, he likes to keep it sinister and disconcertingly jarring. Is home really home, can one go back to it or will we ever find it given what a world this is. Harried and hustled, constantly in motion, blurred encounters between people are all we get. In the minutes we have to ourselves, this is what we ask: where is home. Where do I belong? Music for the lost is what we have here, continually seeking some kind of answer... to make sense of a senseless place. 'Home' has got to be one of the chilliest, most unfriendly albums I have heard this year. Anders lists the winter of 2009/2010 in his credits for what makes this record what it is and I'd have to agree. It's like looking out of your window to see nothing but a white background against a remorseless, malicious white sky that is about to unleash even more of it's spiteful cargo upon the surroundings. You'll be curling up under the blankets hoping this is all just a dream but for one man, there's no waking up when the eyes are as wide open as this release staples them. Total and complete isolation, to have nothing but your own thoughts picking away at your sanity and to know with utmost certainty that it's only going to get uglier the longer you're around. No, this album is not a downer nor is it abjectly miserable. 'Home' simply puts everything into sharp contrast, it's like being given omnipotent focus and control over one's subconscious for the duration of the record. Once it has finished playing, you'll hesitate before listening again, this isn't a piece of work you can pick up and play whenever you like. This here's what you select when alone, late at night, ruminating over the events in your life which have brought you to the point you're now at... when you, too, wonder if you'll ever arrive anywhere recognizable again. There are several similar titles on here, however, none of them are too terribly related. Moreover, they appear to be vignettes which are interconnected through the use of very implicitly dour tones. You're shown one view of this place and allowed to actually linger there for a few minutes but the next vista won't be any more explanatory. The deeper you delve into 'Home', the further from it you'll become. It is elusive and illusory, you'll be certain you've gauged the dimensions and happily draw conclusions but in the end, you'll only find yourself yet again... out in the cold. ahnst anders' latest album reflects the personal changes and experiences in his' life since the release of 'many ways'. for a certain period he lived in berlin and the time he spent in germany's agitating metropolis was the desired and necessary main inspiration for this release. the result might be an artistic rediscovery to those who are familiar with his previous works. being known as a mainly ambient-oriented artist, anders processed the many suggestions he received by applying a rigid intensity, making this album way more solid than anything he has done before. vibes ranging from iciness, disorientation and hatred to euphoria, security and love - the development between being emotively homeless and finding the way home. as the nine tracks were intended to be connected as a whole, it is highly recommended to play the entire album from start to finish as one. from the dark ambient monolith 'intro' to the sanguine, hypnotic title track and the quiet shores of 'hope & homeless' as an epicenter, 'home' might be interpreted as an aural wave starting and ending on a high peak and having a low one at the centre expressing true dynamics. most tracks on this album are built around varied grooves from dubstep to mesmerizing tribal textures to create astonishing ambiences and cinematic soundscapes with a deeply human feel. 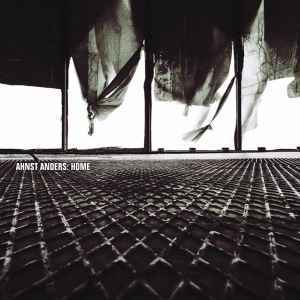 'home' proves to be a very enduring record, on which ahnst anders shows some clear signs of his visionary talent.